We are very excited to announce that Libera is hiring two new staff members mid August! This will allow us to expand much more rapidly around the state, as well as meet the individual needs of women and teens in West Virginia. We are expanding our services to high school girls [previously we have only worked with 18-75 year olds] and will begin some high school groups in the near future. We are hiring a full time counselor, Jessica Haring, and a part time program director, Vanessa Short. The counselor will be available to meet with women individually, and will also go out with us on some of our bus visits to the 55 counties of West Virginia. Welcome, Vanessa and Jessie! Read more about them below in their bios. More news to follow soon on groups and upcoming events! Jessica (Jessie), was born and raised in West Virginia. She received her BFA at WVU in 2012 with concentrations in both painting and photography and graduated with her Master of Arts in Counseling from Reformed Theological Seminary, Orlando in May 2017. She has years of experience with children and teens in different capacities and is passionate about giving them a place to be heard and mentored. In her nearly 500 hours of internship, she has worked with couples, individuals, teens, and children as well as led an Art Therapy group for her peers. She hopes to incorporate creative methods into her counseling practice and be a safe place for women from all walks of life to find someone to walk alongside them in their journey to freedom. In her free time she loves eating good food, going on adventures and pursuing artistic endeavors. Vanessa Short is a native West Virginian. She currently resides in Barbour County WV with her husband of 24 years. Together they have two children. Vanessa has a B.S. in Psychology with a minor in Sociology. She will begin an academic adventure in the fall of 2018 as she will be pursuing a Masters Degree in Clinical Social Work. She has over ten years’ experience working with women in various capacities helping them soar to their individual definitions of success. Currently she volunteers as a sexual assault advocate. Vanessa is passionate about community engagement and believes that community involvement is part of positive citizenship. Currently she facilitates a book club for women in her community that emphasizes interpersonal development, self-discovery and personal growth, while creating an environment for supportive relationships to develop and deepen. She lives and works from a horizontal perspective and believes that we (women) all have a rich offering of self to bring to the table that will enrich, empower, and impact each other’s life. Vanessa believes that life, growth, and overcoming is best addressed from an integrative holistic approach. She enjoys going on adventures with her husband and family time together with him and their children, laughing and simply being. She is a decorating, party hosting diva who enjoys entertaining, crafting in a variety of modalities, and a great flea market find. Thank you so much to all of you who made Libera’s first “Walk Across the State” a success! We appreciate those of you walked and got pledges, whether you walked 3 miles or 20 miles! We are also very grateful to each and every donor. Each dollar makes a difference! And finally, thank you to our corporate sponsors: Chestnut Ridge Church, always leading the way in supporting Libera; Phoenix Bakery, Pies & Pints, and Feast to West Cafe. We would also like to take this opportunity to again thank Premier Chevrolet Buick GMC for the complete funding of the purchase of our Libera bus, Libby! The Walk raised over $5,000 to keep Libby traveling around the state. Year End Wrap Up and "Thank Yous"
We wanted to highlight a few things we’ve done at the end of December, and thank some people who’ve made all that has happened this past year with Libera possible. Look for a post in the next few weeks about plans for the coming year, and our annual report. We have some big “thank you’s” to give out! So many people have helped Libera’s first full year as a 501(c)3 be transformational for many women. First, we must thank the founders of Libera and the Libera model: Nnenna Minimah, Tamara Miller, Carla Weaver, Alise Chaffins, Barb Ruggieri, Cathleen Kealey, Karen Haring. A huge thank you to the Libera board, who help move us forward and keep us in line with the vision and mission: Nnenna Minimah, Tamara Miller, Darla Hickey, Alise Chaffins, Nikky Luna, Gary Jarrell, Troy Ball, Barbara Myers. We thank our Advisory Board who counsel us and help us move forward: Thomas R. Schroeder, Melissa Watkins, Dorinda Kisner, and Ann d’Auteuil Bartolo. A shout out to our Listeners [what we call mentors], who help lead groups, meet with women, and are being trained to carry Libera forward: Teresa Martin, Gigi Hefner, Pearl Bingham-Marrow, Kim Sheets, Carla Weaver, Tamara Miller, Kelsey Riggi, Darla Hickey, Stephanie Pendley, Joan McKay, Ivy Guiler, Jessie Haring. Our first sponsor “thank you” must go to Chestnut Ridge Church, for their very generous funding commitment to help launch Libera. They have made Libera possible this first full year as a 501(c)3. Our second sponsor “thank you” must go to Premier Chevrolet Buick GMC and John and Helen Cognac for their extremely generous donation of funds for our Libera bus, Libby. They helped get us up and going and on the road. Huge thanks to the North Central West Virginia Women’s Giving Circle for their grant to allow our Listeners to attend a 2 day training in Miami, to become better equipped to listen to women’s stories, identify barriers they face, and help them overcome them. Thank you to MedExpress for their recent generous donation to Libera. 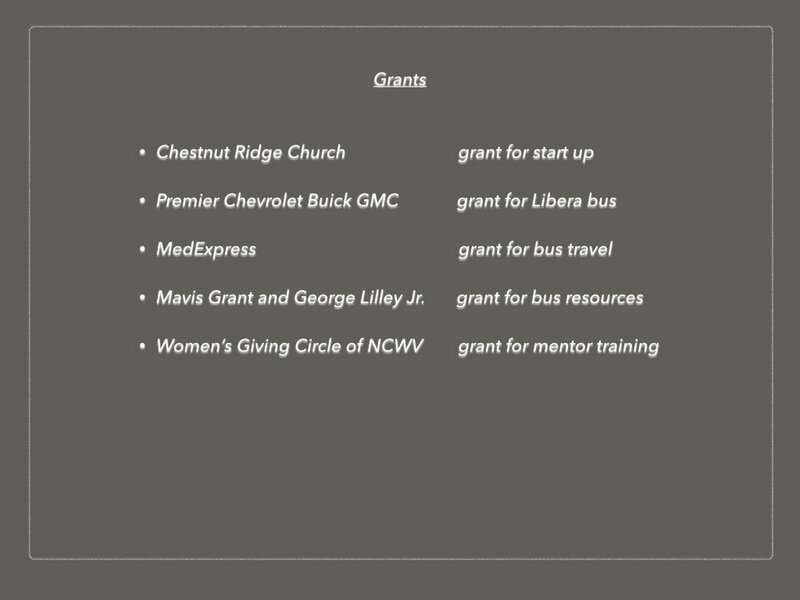 Thank you to Your Community Foundation and Mavis Grant and George W. Lilley Jr. Community Enhancement Fund for the donation to purchase supplies for the Libera bus- resources such as books, CDs and Libera model workbooks to help women address their barriers. All of our “100 club” donors who are an ongoing support to Libera: Sue Kesey, Barbara Ruggieri, Derek & Sarah Jones, Moe & Janie Rubenstein, Tim & Karen Haring. These people have committed to giving $100 a month to Libera, to help sustain the work that we are doing to empower West Virginia women.And to the many others who have generously donated to Libera this year, we thank you! And to the many others who have generously donated to Libera this year: monthly, once, or with volunteer service and in kind gifts like bus batteries, we thank you! Have you wondered what Libera is all about? Do you have limited time, but want to take steps to overcome your barriers and find more freedom? Don’t miss the LIBERA MODEL ONE DAY WORKSHOP! She now wants to go out on the bus with us, to meet other women and tell her story. We spoke to a local women’s group that had previously passed out rack cards with the human trafficking, domestic violence, and sexual assault hotlines. One woman said 8 or the 10 cards she placed had been taken. It’s a good sign that women are getting connected to the help they need. We spoke to the Women’s Giving Circle of North Central West Virginia, who funded the 10,000 rack cards [see above] that we are placing around Mon, Marion, Taylor, Harrison and Preston counties. We shared stories of a few women who have found more freedom and empowerment through Libera. We have passed out over 400 rack cards that were funded by Libera in other counties around the state. Two WVU classes, a communication and a leadership class, are now placing 1500 of the rack cards around Mon county in hotels, nail and beauty salons, gas stations and truck stops, and bars. We had a spectacular Wednesday where we were able to take a woman to the Marion County Prosecutor’s office, and keep her with us on the bus all day until her former partner, who was out of jail and threatening her, was secured in the North Central Regional Jail. We were also able to reach out to many women in Harrison County that day, and we made a strong connection with a woman at Fairmont State. She will also be a great connection to women in Barbour County. The final effort that day was our new group in Marion County. We followed up with several women who have completed the Libera groups,connected them to specific resources to overcome their barriers, and encouraged them to pursue the dreams they have. We started two new Libera model groups; we are expanding to reach other counties, as we started the first group in Marion County. We made some new connections with women in Martinsburg, Elkins, and Beckley. We attended an exciting conference put on by the West Virginia Women’s Commission, “College Dreams Ignited.” We listened to author Carol Leary discuss her book, “Achieving the Dream,” heard stories of women who overcame obstacles to obtain degrees in higher education, and had some great networking and collaboration time with women from around the state. We were able to get many copies of “Achieving the Dream” to help resource women who are looking to overcome intellectual barriers to freedom. We became much better equipped to help women pursue higher education. We found out that WV ranks the lowest of the 50 states for women with bachelor’s degrees-19%. We want to change that! We were also able to make good connections to further connect women to resources in the future.